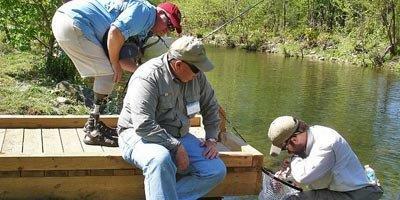 Fly Rod Chronicles and Project Healing Waters teamed up for the flagship event of the year, the Two-Fly Tournament. Special guests across the nation joined in to raise money for our country's grateful veterans. Project Healing Waters Fly Fishing, Inc. is dedicated to the physical and emotional rehabilitation of disabled active military service personnel and veterans through fly fishing and fly tying education and memorable outings with special guests, like award-winning host Curtis Fleming from the "Fly Rod Chronicles." The tournament is one of the many endeavors that take the beloved veterans on fly fishing trips of a lifetime, getting them out of the hospitals, away from their scars, and put their hands and minds working on the stream with teaching them the art of fly fishing and fly tying. "One of the greatest aspects about Project Healing Waters is they are not just committed to recently vetted soldiers," Fleming said, "they care for all veterans from the earliest World War I to those returning from the battlefields." This year's event was captured on film by Fleming and the crew of "Fly Rod Chronicles" at the pristine Rose River Farm in Madison County, Va., near those world-renowned bridges. The public event raised more than $230,000, which will directly benefit the therapy needed for our soldiers to repair themselves both mentally and physically. Fly fishing heroes and celebrities joined in including legendary Lefty Kreh, Joel Stewart (author of "A Fly Rod in My Sea Bag"), Joe Humphries, Rick Pope from Temple Fork Outfitters, and other high ranking military personnel. Curtis shares special moments on this week's show with veterans who have served our country by sacrificing their life, limbs, and flesh to keep world peace. As veteran Chris Frost, who lost both legs, maneuvers his arthroscopic limbs in the rippling water, the crew is quickly humbled by the feat and with the soldier who never whispers a complaint. Blessings are abundant in each segment of this week's show on "Fly Rod Chronicles" with Curtis Fleming.